"I won't be disgraced any further!" The above info came from Sting Ray, and was edited by yours truly (contact me). The image came from Zaku. Zaku is a Sound Ninja Genin who Naruto encounters during the Chunin exams. Though he is gifted, Zaku doesn't seem to have a lot of luck in finding opponents. His battle with Sasuke during the second part of the exam lands him with two broken arms and a hurt ego. His second battle, with Shino, ends with his own arm being severed due to Shino's beetles. A lot of Zaku's past remains a mystery, though he seems severely loyal to Orochimaru. Zaku seems to think that Orochimaru truly believes in his abilities, though to the devious mastermind, he is only an easily disposable pawn. Part of the three ninja team from the Hidden Village of Sound, Abumi and his teammates were asked by Orochimaru to kill Sasuke. But it was eventually found out that they were only testing Sasuke's powers after Orochimaru's curse was put on him. Abumi's arms were later badly injured at the hands of Sasuke. 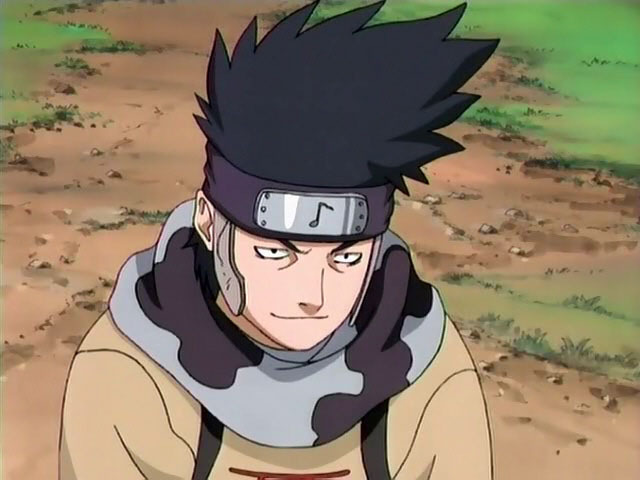 In the third stage preliminaries of the Chunin selection exam, Abumi faced Shino from the Leaf Village. He was later used as a sacrifice for the Second Hokage's body that was later summoned by Orochimaru. The above description came from Sting Ray, and was edited by yours truly (contact me). Zaku is a Genin from Oto no Kuni (Land of Sound). He and his teammates Dosu Kinuta and Kin Tsuchi, are followers of Orochimaru. Growing up, Zaku was a orphan who lived on the street. In order for him to eat, he stole food, and was beaten for it. It was then that Lord Orochimaru told him that he "liked" the potential that he saw in his eyes, and so he took Zaku in. Zaku was probably given some kind of surgery in his arms to help him manipulate air pressure, and supersonic sound waves. The two tubes in his hands allow him to manipulate sound waves and air pressure. He is able to obliterate boulders, and make the ground itself as soft as a cushion. His ability's are Zankuha (Decapitating Air Wave), and Zankukyokuha (Extreme Decapitating Air Wave). During the 2nd stage of the Chunin exam, Zaku and his teammates go after Sasuke Uchiha, with orders from Orochimaru to assassinate him. At first they fought well, but when Sasuke wakes up, Zaku ends up getting two badly dislocated arms. In the 3rd part of the Chunin exam, Zaku fights Shino Aburame, and ended up blowing off his right arm. Orochimaru uses the three of them as his guinea pigs, in order to test Sasuke's powers. In the end, for Zaku he and his teammates, they are betrayed and murdered by Orochimaru and are all sacrificed. Zaku's name is derived from "to cut," which relates to his "air cutter" attack. It is also the sound of a person walking on snow or sand. With the former name meaning, he and his two teammates have names relating to swords, fitting based on their aggressive behavior and deadly intentions. However, based on the latter meaning, he and his two teammates all have names that come from onomatopoeias, fitting since they come from the Hidden Sound Village. Their naming pattern (Slash, Clang, and Crunch) is similar to that of Snap, Crackle, and Pop. The three symbols on Zaku's chest are all the kanji 死 ("Shi", death). The above description came from Courtney Mullins, and was edited by yours truly (contact me).